Plugin to add clipboard paste support, as well as ctrl left/right and backspace/delete to aid typing in console. Improve method for obtaining input string, now works if iConsoleVisibleLines is changed. Added hook to limit input string to 255 characters. TAB character is ignored while Alt-Tabbing in console. An NVSE plugin adding hotkeys for pasting and enhanced movement/deletion. Paste has a limit of 500 characters. By default newline characters are replaced with spaces, although this can be changed to sending each line as a command in the nvse_console_clipboard.ini file. 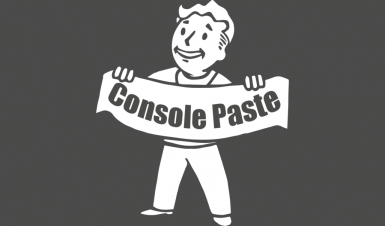 Thanks ItsMeJesusHChrist, creator of Consistent Pip-Boy Icons for the shiny icon!